In 2013 there will be a new streetcar on First Hill, connecting the Capitol Hill light rail station to the International District light rail station. And it’s looking more and more like that streetcar will be traveling on Broadway, and not on 12th Avenue to the east or further west on the First Hill. We’ve learned that on Wednesday the mayor held a meeting that included all of the interested parties around the project, such as the hospitals, Seattle U, and community council representatives. In that meeting the mayor revealed that the city Department of Transportation has made a recommendation in support of the Broadway route, and attendees at the meeting report that the mayor indicated that he was leaning towards the Broadway route as well. We’ve made an inquiry to the mayor’s office to confirm this and get a better read of his position, but so far have not heard back. Thanks to neighbor George for onpassing this presentation from the SDOT meeting with details of their recommendation. Make sure to check out the last slide — looks like SDOT is also lining up behind the Aloha extension. As we reported last month, the Broadway route came out with the lowest overall cost and reasonably high ridership. Comparatively, the 12th Avenue route cost a bit more (but still within the project budget) and had a slightly lower range of estimated ridership. The twisting, turning western routes through First Hill exceeded the project budget, but provided slightly higher ridership potential. The final decision on the route will be decided by the Seattle City Council, and it’s anticipated that their decision could come as soon as April. Supporters of the 12th Avenue/Broadway couplet tell us that they’re still pulling for that option and will continue to try and gain the support of city leaders. SDOT has recommended a two-way Broadway Ave alignment for the First Hill street car. Earlier this week, Mayor McGinn hosted a meeting of First Hill and Capitol Hill stakeholders to hear their perspectives on the alignment options. It was a productive and open conversation. The Mayor is considering the SDOT recommendations and the input he heard from the community earlier this week and expects to send a proposed alignment to Council for their consideration within two weeks. another nightmare digging up the street…but would be nice to have one. This is clearly the best route, except I think the Pioneer Square loop is both better and more likely than Weller St. Now we need to push ST to let us use any cost savings to design and plan an extension to Aloha St.
and as much of a congestion nightmare that I think Broadway will be, I think the construction impact will not be terribly high. The South Lake Union line was built with very minimal impact from what I saw commuting on the 7x’s to/from Downtown from/to the U-District back during construction. If we could adopt the community councils vision for broadway with less lanes and seperated bike lanes, while moving Broadway away from being a car-centric arterial to a more transit and pedestrian friendly thoroughfare, I would support it wholeheartedly. “The South Lake Union line was built with very minimal impact”. Correct: it was next to my window at work. Great plan. But the CHCC proposal is excellent in its call for a complete redesign of the “street scape” – I suggest that will be more like a curb to curb rebuild on the full length of Broadway. If this fine idea is fully implemented, it can’t be quite as simple as other projects. Exciting plans, Seattle can set a standard. Federal money? Make sure we re-elect U S Senator Patty Murray. Compliments to the Community Council and its wonks. Yeah in the presentation they have the pioneer square loop so I’m assuming that is the recommendation. 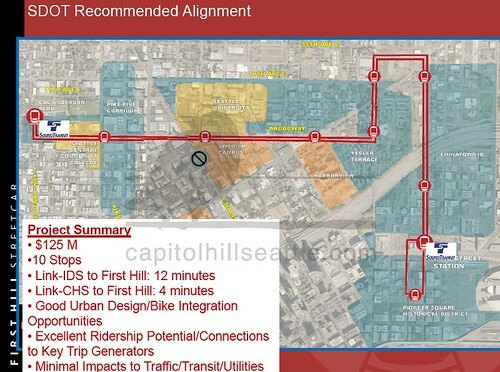 See, the thing about the CHCC proposal is that it really is for Capitol Hill. The majority of the Broadway segment is outside of the Hiil. Ours is definitely the portion that would benefit most from their vision and I 100 pecent support it, but I’d be that they re-designing of the streetscape would probably end at Madison. I would really enjoy seeing Broadway from Madison to as far as Roy/Aloha to look like their proposal. Impact could be a bit high for cars if that was to happen, but not for bikes or pedestrians. You can take Harvard for biking and pedestrians HAVE to have a walking space during contruction projects prer SMC laws. Please please please don’t re-elect Patty Murray. That map should be changed to show the Pioneer Square Loop rather than the Weller Street Loop. I was pleased to see the Pioneer Square option is preferred as that will help another neighborhood hopefully redevelop in a positive way. What I really like most about this alignment is how straightforward it is. Streetcars really work best when they are simple, easy to understand, convenient, etc. Let the bus network have twists and turns to give everyone access–that’s the advantage buses have, their flexibility. Streetcars have the advantage of place-making, which is diminished if you have them winding all over the place. The only weird twist this route has is the jog over to 14th avenue, but that has to happen because of geography and because Yesler Terrace doesn’t have a normal street grid. Anyway, I love that if this is built people will be able to easily look at a route map and have a clear sense of where they are going. The other alternatives lack that clarity. Finally, a step forward! There is real potential to improve transit and livability along the entire line. Let’s hope the hard work of community groups (and city and ST officials) pays off. The only misleading portion of this article is that the street car will have to stop at Pine in 2013 until the Capitol Hill light rail station is completed in 2016. Frustrating. The Aloha Extention is a no brainer! It’s ridiculous to cut half of Broadway’s businesses off from this new transit option and you can’t do street improvements only half way down such a major corridor. Reading the article about the Streissguth gardens, it shows that a streetcar ran all the way down 10th to Lynn as far back as the late 1890s! So it shouldn’t really even be up for discussion as whether to cover all of Broadway but to focus on finding the funding asap. Now let’s just figure out a way to connect all these new lines so that we don’t have such a fragmented system!